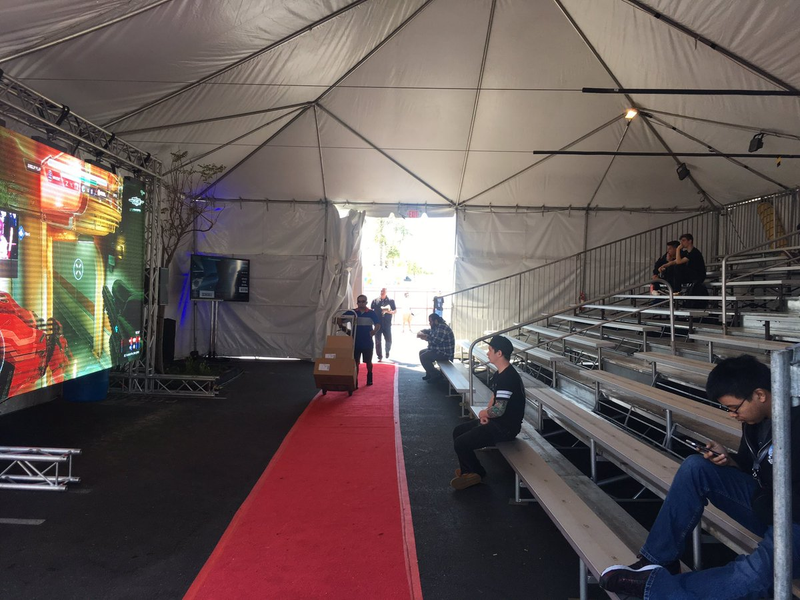 The “overflow” tent for the Halo 5 World Championship. Image credit: Frank. 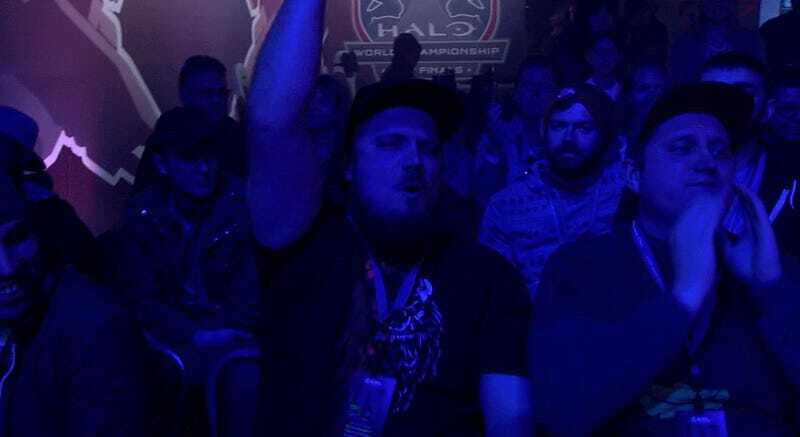 Competitive Halo’s biggest event of the year is going on right now but some fans are arguing about the venue and how many people are in attendance. The tournament has a prize pool of $1,000,000, but pictures on the ground tell the story of a more deflated event. The contrast was so stark it drew comparisons to the year prior when the Halo Championship was held in Raleigh Studios Hollywood with a prize pool of over $2,500,000. Tyler “Ninja” Blevins of Luminosity, a top Halo team and strong contender for the championship, tweeted his dismay earlier in the day that event staff were being fed before pro players as he waited in line for his lunch. But this also provoked a defense from others in the Halo community who felt the snark was inaccurate and misplaced. Greenskull noted that the tent many were passing around pictures of was actually for overflow, and took to Twitter to post shots that were more affirming of the event. This was what the tent apparently looked like during matches as opposed to in-between them during the down time. He also shard a picture of the main stage area where the premium seats were, and while they complicate the narrative a bit, they certainly aren’t doing the work Greenskull seems to think they are. Here’s a map of the venue to help put everything in perspective. Food truck alley is where most of the pictures have been taken. That red rectangle is where the tournament’s biggest matches are taking place. Up until recently, there was a second stage where loser’s bracket matches were being held, but Ninja stated that at some point ESL said that as long as the players involved agreed they would play all the remaining matches in the main lot. The tournament feels much more “Halo Festival” than it does a sporting event which teams who have been working towards all season. Halo fans and players must often eek out a competitive existence in the shadow of top-tier first-person shooter esports like Call of Duty, and the pictures going viral from this World Championship certainly won’t help matters. After all, the 2016 grand finals for Call of Duty were held at The Forum arena, a venue spanning generations of NBA play and musical performances. It’s hosted Prince, Elvis, and the Lakers. The American Campus recently hosted the indie rock duo Buscabulla. Their respective Google views tell a similar story. The main stage is that first grey pod close to the center of the image above. Inside the fans, seated beneath strobe lights as if they were about to be sold a timeshare by a Daft Punk cover band, are into it. But the room as a whole, some five rows deep with an army of photographers, event planners, and announcers to rival the spectators, can’t help but be a deflating sight for game with such a lineage that’s trying to buy its way through a mid-life crisis of sorts, surpassed by burgeoning scenes in other games despite the desire of Microsoft, ESL, and others to show fans of the game, the series, and shooters in general that there’s something special going on here. That’s the scene at the Halo 2 National Championships in Las Vegas back in 2007, years before someone like Marketplace’s Kai Ryssdal had ever even considered uttering the phrase “esports” on live radio. No matter how much some companies want to invest in the myth that if you create it, and award enough prize money for being the best at it, gamers will flock to you in droves, its hard to paper over a lack of grass roots fandom with headline-making prize pools.